Setting up taxes and tax rates is one of the first tasks you want to perform when setting up a store. Taxes can be a complex matter, but WooCommerce aims to make setup as straightforward as possible. We recommend consulting with a tax professional or an accountant on what may be your best options, plus any applicable laws to your state, country or business. Each business is unique, and there’s no way we can cover millions of possibilities. To access the tax settings screens, they first need to be enabled. Select the Enable Taxes and Tax Calculations checkbox. Go to: WooCommerce > Settings > Tax. This tab is only visible if taxes are enabled. The Tax tab displays several options that can be set to suit your needs — settings you choose are based on the tax jurisdiction under which your store is located. This option is perhaps the most important when managing taxes in your store, as it determines how you input product prices later on. “Yes, I will enter prices inclusive of tax” means that all catalog prices are input using your store’s base tax rate. For example, in the UK you would input prices inclusive of the 20% tax rate e.g. You enter a product price of £9.99 that includes £1.67 tax. A customer in the UK would pay £9.99 as defined, and a customer in the US would only pay £8.32. “No, I will enter prices exclusive of tax” would mean that your catalog prices need to be tax exclusive. Using the example from above, a UK shop would enter 8.32 at the product price. A tax of 20% would be applied on top of this during checkout making the amount payable £9.99. More at: How Taxes Work in WooCommerce. This setting determines which address is used for tax calculations. If you use store base address, taxes are always based on your store location and not your customer’s location. In most setups, shipping tax class is inherited from the item being shipped, e.g., Shipping a reduced rate item such as baby clothes would also use a reduced rate. If this is not the case in your jurisdiction, choose a different tax class. If you enable Rounding tax at subtotal level, instead of per line, the rounding is done at the Subtotal level. Check your tax jurisdiction to know if this is done. Tax Classes are assigned to your products. In most cases, you want to use the default Standard class. If you sell goods that require a different tax class (i.e., Tax, except zero-rated products) you can add the classes here. To get started, we include Standard, Reduced Rate and Zero Rate tax classes. Each class is listed at the top of the tax settings page – click a class to view tax rates assigned to the class. 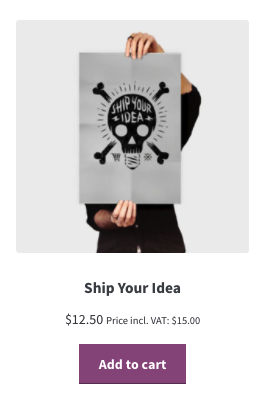 This option determines how prices are displayed in your shop/catalog. Choose from inclusive/exclusive tax display. This option determines how prices are displayed in your cart and checkout pages – it works independently of your catalog prices. Choose from inclusive/exclusive tax display. Note: The address field needs to be filled in to get tax calculations if you have a tax table that distinguishes between locations. This determines if multiple taxes get displayed as one total during checkout, or as an itemized list of taxes. Tax classes are displayed at the top of the tax screen. Click one to view tax rates for the class. In the tax rates table, you can define tax rates (one per row). Click Insert Row to get started. State Code – 2 digit state code for the rate. See i18n/states/COUNTRYCODE.php for supported states. For the US, use a 2 digit abbreviation e.g. AL. Leave blank (*) to apply to all states. ZIP/Postcode – Enter postcodes for the rate. You may separate multiple values with a semi-colon (;), use wildcards to match several postcodes (e.g. PE* would match all postcodes starting with PE), and use numeric ranges (e.g. 2000…3000). Leave blank (*) to apply to all postcodes. Priority – Choose a priority for this tax rate. Only 1 matching rate per priority will be used. To define multiple tax rates for a single area you need to specify a different priority per rate. Compound – If this rate is compound (applied on top of all prior taxes) check this box. Here is an example of a tax setup for a UK store — 20% for UK customers only. In this example, we have a 6% tax rate for all U.S. states except California, which has a 7% tax rate and a local tax rate of 2% for ZIP code 90210. Notice the priorities — this demonstrates how you can ‘layer’ rates on top of another. There are Import CSV and Export CSV buttons below the table with the rates. You can use them to import and export tax rates to and from a CSV file. Leave tax class blank for standard rates. Below we’ve provided a sample tax rate CSV to import for the United States based on state tax only. This should not be used for production/live purposes, as tax rates frequently change. Double-check any rate for accuracy before using. If you incorrectly added tax rates or the CSV import has incorrectly added tax lines, this information needs to be deleted. Select the incorrect lines by clicking on them. They are highlighted in yellow. Select Remove Selected Rows. This deletes the highlighted row(s). If you want to delete all tax rates at once, use Delete WooCommerce Tax Rates in WooCommerce > Status > Tools. 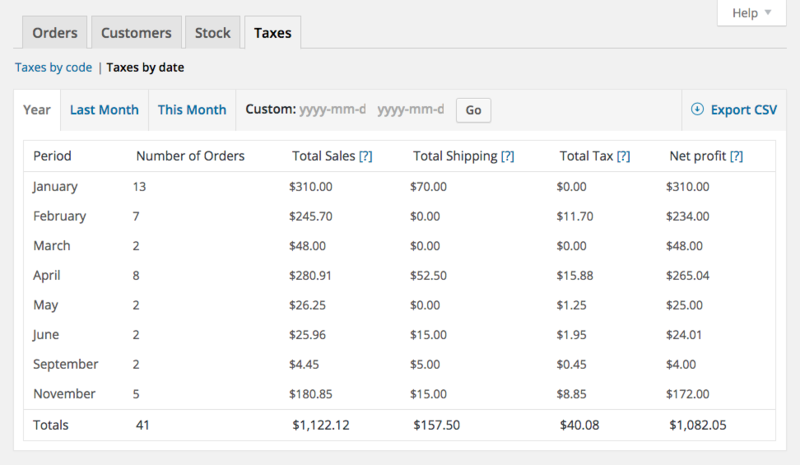 Tax reporting can be found in WooCommerce > Reports > Taxes > Taxes by Date > Year. This report allows you view taxes for the year. Going to Reports > Taxes > Taxes by code displays a different report, showing taxes separately. If you are entering prices including tax, you should be aware that this price might change based on the country in which your customer is located. For example, your store is in the UK, so you create one tax rate for GB of 20%. You create a product with a tax inclusive price of £120. Customers in the UK will pay £120 (£100 + £20 VAT). Customers outside the UK will pay £100 because you do not have any tax rates set up for any other country. Your store is in the UK, so you create one tax rate for GB of 20%, a tax rate for France of 19% and Norway at 25%. Customers in France will pay £119 (£100 + £19 Tax). Customers in Norway will pay £125 (£100 + £25 Tax). Customers outside the UK, France or Norway will only pay £100 because you do not have any tax rates set up for any other countries. This is explained in more detail at: How Taxes Work in WooCommerce. This can be done but is an experimental (not officially supported) feature. Read: How Taxes Work in WooCommerce. Since taxes are based on customer location in most setups, things like geolocation can make taxes hidden until the user checks out and inputs their real address. To prevent this, go to WooCommerce > Settings > General > Default Customer Location to disable Geolocate and set to the Shop Base Address. To edit your tax options back, choose Disable automated taxes and click Save changes. Why do prices change when “Prices Include Tax”? Can I charge one amount regardless of customer location when defining prices including tax? 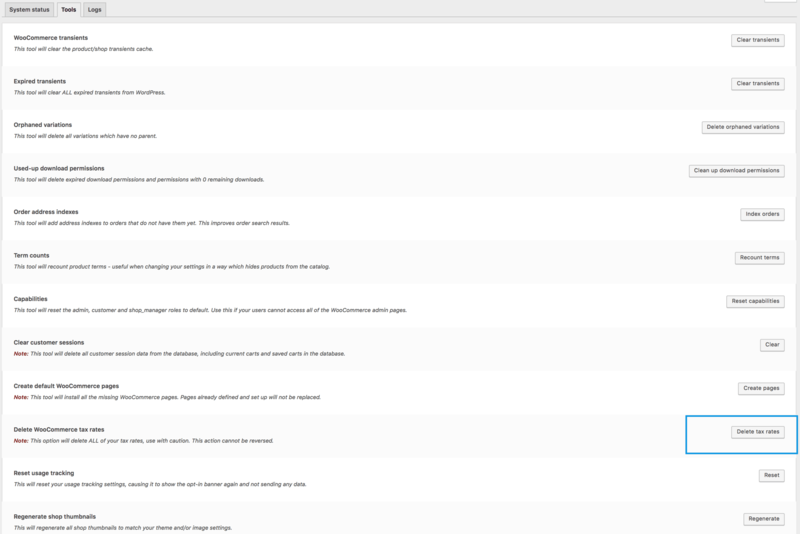 When some users visit my store, taxes are not shown. Why tax options are greyed out?